Never Have a Dull Day with Pokie Pop’s Weekly Calendar of Bonuses! Pokie Pop, a great new casino, offers players top quality promotions with a hot Welcome Bonus and weekly promotional offers. In addition to this, there are a number of other bonus and free spins offers for special occasions. In our collection, we offer you some of the best Australian online casinos. But we would highly reccomend taking a lok at pokie Pops for the following reasons. Tuesdays at Pokie Pop Casino come with the choice of two different promotions. Get either a match deposit bonus or a special free spins offer, and "Crash, boom, choose! You just can’t lose!" Wait for Wow Wednesday and enjoy a special match deposit bonus offer. Unlock this bonus with a $20 deposit, and enjoy a wonderful, Wow Wednesday surprise match bonus. What a treat for the middle of the week! What the Friday - Double the Choice! What the Friday, or the WTF promotion gets you ready for the weekend. After a long week, Friday gets the good times rolling. Choose from one of two match deposit bonus offers. Remember that the bigger your deposit, the bigger the casino bonus money is. Give yourself a boost into the weekend with a minimum deposit of $20. 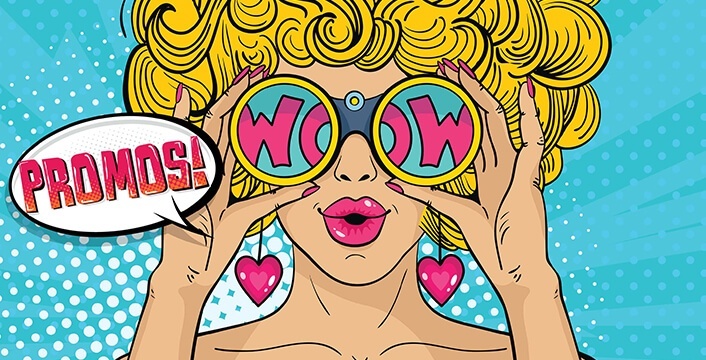 The casino welcomes its players as Agent Awesome, because you are awesome with an invitation to go undercover. Join the Super-Secret Saturday mission at Pokie Pop Casino with a choice of secret offers. With five secret offers available, you get to pick one, and enjoy your Secret Saturday bonus. Friday may set the tone for the weekend, but Saturday is the weekend! Choose your bonus, deposit at least $20, and then pop open your match deposit bonus offer, and get winning! Sunday Funday for the Win! Last but not least is Sunday Funday! On Saturday you had to choose, but Sunday simply triples the fun. Pokie Pop Casino offers players three brilliant match deposit bonus offers on Sundays. Each match deposit bonus runs for a total of eight hours, and you can enjoy all of them! Unlock each special offer with its own $20 minimum deposit. Make sure to fulfill the Pokie Pop Casino’s Terms and Conditions in order to enjoy these great Weekly promotional offers. Make a minimum $20 deposit on bonus offers unless otherwise stated. The casino awards bonuses only when you comply with the minimum deposit amount. First select your bonus, and then make your deposit. Unless otherwise stated, standard free spins winnings come with 40x wagering requirements. The Pokie Pop Casino limits free spins winnings to $200. No deposit free spins come with a 50x play through requirement on winnings with a $200 withdrawal limit. The casino automatically removes any winnings over and above the $200 limit. Once credited, free spins last for 48 hours. Newbies at Pokie Pop Casino have plenty to look forward to! Being a new casino, Pokie Pop knows what it’s like to feel new in the great big online casino world. No need to worry because you’ll fit right in with the wild and wonderful Pokie Pop welcome bonus offers. Get up to $2,500 in bonus money over your first three deposits at the casino. In addition to the bonus funds, play 100 spins for free! Start with your first deposit of at least $20. Get a 100% match deposit bonus up to a possible $1,000. When your first deposit takes place, the casino gives you your 100 free POP Spins. Play the first 20 spins on your first day at the casino. After that, make sure to log in for the following four days. 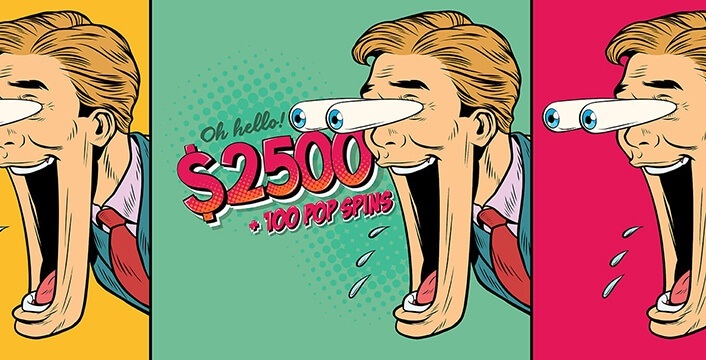 After each 24-hour period, you get another 20 spins until you use all 100 Pop Spins. Redeem your five days of free spins when you click the free spins symbol as seen on the promotions page. Your second deposit of $20 or more comes with a 75% match deposit bonus up to $750. When you complete your second deposit funds, place another deposit of $20 or more and get your final welcome bonus. Enjoy another 75% match deposit bonus up to a maximum total of $750. VIP players benefit from a number of exclusive offers and other perks such as dedicated VIP hosts. Pokie Pop Casino certainly knows how to treat its loyal players! There are also exclusive VIP bonus offers, no bonus max bets, and big withdrawals. There are specially selected VIP cash back offers and preferential cash-ins.